The MCYSA/USSSA 15U Summer International Championship held a tribute to Armed Forces before featured games Sunday, July 29, 2012 at Lippold Park in Crystal Lake. Mike Greene - mgreene@shawmedia.com Honor Guard Members Jason Moody (left) and Fredrick Nobel, a WWII veteran from the 95th division, roll up the American flag following a MCYSA/USSSA 15U Summer International Championship tribute to Armed Forces Sunday, July 29, 2012 at Lippold Park in Crystal Lake. Active and veteran armed forces members were honored before the start of featured games which were umpired exclusively by armed forces veterans. 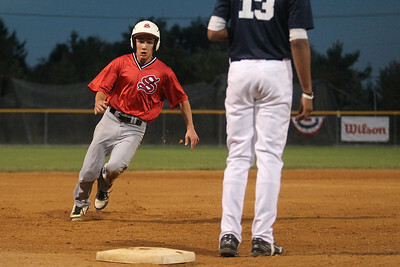 Mike Greene - mgreene@shawmedia.com Illinois Stix' Tyler Nickleski rounds third base during a 15U Summer International Championship game against the Puerto Rico Potros Sunday, July 29, 2012 at Lippold Park in Crystal Lake. Active and veteran armed forces members were honored before the start of featured games which were umpired exclusively by armed forces veterans. 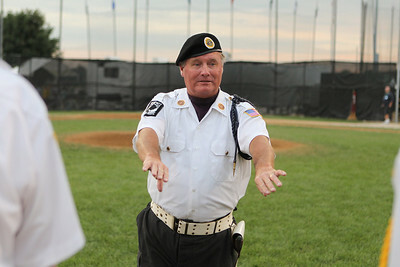 Mike Greene - mgreene@shawmedia.com Lake in the Hills American Legion drill sergeant Mike Peltier organizes veteran and active armed services members prior to a MCYSA/USSSA 15U Summer International Championship tribute to Armed Forces Sunday, July 29, 2012 at Lippold Park in Crystal Lake. Active and veteran armed forces members were honored before the start of featured games which were umpired exclusively by armed forces veterans. Mike Greene - mgreene@shawmedia.com VFW 5040 senior vice commander Jason Moody looks into the stands during a MCYSA/USSSA 15U Summer International Championship tribute to Armed Forces Sunday, July 29, 2012 at Lippold Park in Crystal Lake. Active and veteran armed forces members were honored before the start of featured games which were umpired exclusively by armed forces veterans. 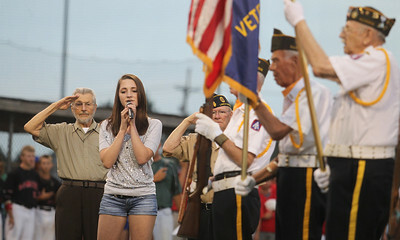 Mike Greene - mgreene@shawmedia.com Melissa Drzal sings the national anthem during a MCYSA/USSSA 15U Summer International Championship tribute to Armed Forces Sunday, July 29, 2012 at Lippold Park in Crystal Lake. Active and veteran armed forces members were honored before the start of featured games which were umpired exclusively by armed forces veterans. 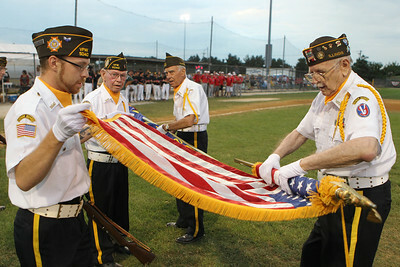 Mike Greene - mgreene@shawmedia.com Fredrick Noble, a WWII veteran from the 95th division, dismantles an American flag following a MCYSA/USSSA 15U Summer International Championship tribute to Armed Forces Sunday, July 29, 2012 at Lippold Park in Crystal Lake. Active and veteran armed forces members were honored before the start of featured games which were umpired exclusively by armed forces veterans. 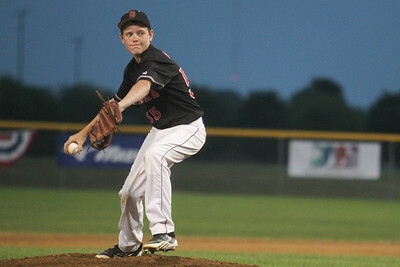 Mike Greene - mgreene@shawmedia.com Crystal Lake Bombers' Jeremy Gregory pitches from a stretch during a MCYSA/USSSA 15U Summer International Championship game against the Puerto Rico Cardenales Sunday, July 29, 2012 at Lippold Park in Crystal Lake. Active and veteran armed forces members were honored before the start of featured games which were umpired exclusively by armed forces veterans. 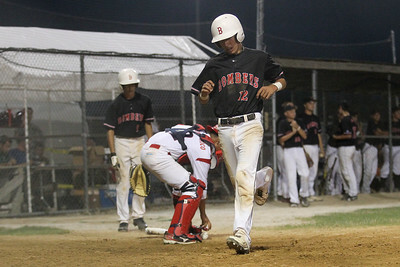 Mike Greene - mgreene@shawmedia.com Crystal Lake Bombers' Johnny Nugent crosses home plate after a bases loaded walk during a MCYSA/USSSA 15U Summer International Championship game against the Puerto Rico Cardenales Sunday, July 29, 2012 at Lippold Park in Crystal Lake. 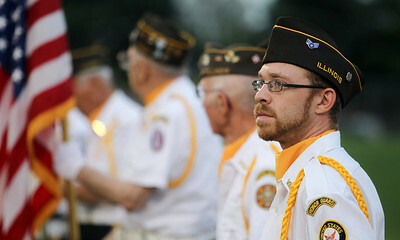 Active and veteran armed forces members were honored before the start of featured games which were umpired exclusively by armed forces veterans. 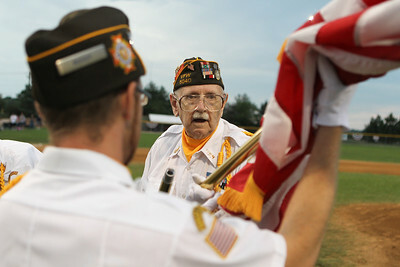 Fredrick Noble, a WWII veteran from the 95th division, dismantles an American flag following a MCYSA/USSSA 15U Summer International Championship tribute to Armed Forces Sunday, July 29, 2012 at Lippold Park in Crystal Lake. Active and veteran armed forces members were honored before the start of featured games which were umpired exclusively by armed forces veterans.